Occasionally we get to announce to the world (or at least anybody following this feeble little blog) something truly historic. And in this case, dear readers, it not only is historic—that is, of great historic significance–but it is uniquely an offering of Hearts & Minds. We are currently the only bookstore stocking a brand new book, and this brand new book commemorates and participates in something rare and good and beautiful. This really is big news, and something very, very special. Come on man, you’re thinking, get on with it. What is worthy of this sort of acclaim and suspense? Just tell us about the thing. Well, surely your eye has already seen the headline announcement, and you can’t miss the book-cover, so you can see it is called Rouault Fujimura Soliloquies (Square Halo Press; $19.99.) Let me try to explain its heady significance. Not only is this a major showing of the world famous Frenchman (and an impressive body of very new work by Fujimura) it seems that some of the Rouault paintings are being shown publicly for the first time. Although the story may be more interesting than this short telling, Mr. Fujimura has become friends with the family of the Rouault estate. He has visited the esteemed painter’s Gare de Lyon studio, has become familiar with the environment and family of the man who was a contemporary of, and influence upon, Picasso, Matisse, even Cezanne. That this youngish, evangelical, Japanese-American New Yorker would gain trusted access from the grandchildren of this French intellectual Catholic–who often sought out the poor, the marginalized, the odd and sad—is remarkable, and a fabulous backstory to this emerging work. In other words, Mako seems to have gotten them not only to allow him access, but to send paintings over to be displayed in New York, and the electronic files of the photos of them to the Square Halo office in Pennsylvania to be made into a new art book. 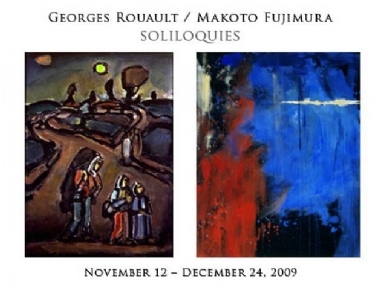 Hence, Rouault Fujimura. Kudos to Square Halo Press’s main man Ned Bustard for his speedy and ingenious design and arrangement of this small book, doing the lay-out with files sent from Paris, handling pictures of Rouault works that few have seen. As he worked overtime to size up the color and tone and and allusive calibre of each work—early 20th century and early 21st century—Bustard prayerfully reflected on each painting, and how they could be featured alongside the two lengthy chapters of solid prose. The small handbook, printed well on glossy paper, a trim size, with very vivid coloration, is itself a work of art. 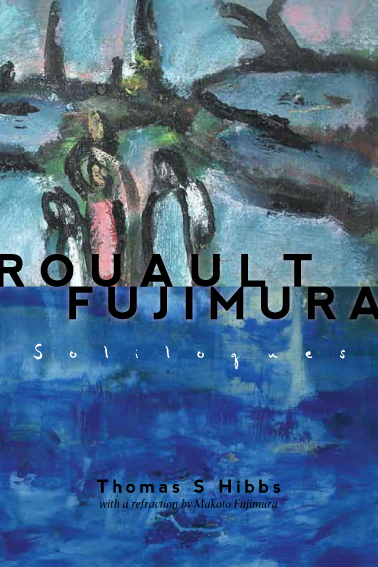 Rouault Fujimura Soliloquies is a book worth owning even if one cannot get to New York to see this important contribution to contemporary art. In fact, it is worth owning if you don’t know anything about any of this. What a beautiful and moving way to get a small bit of art education. What a great gift for any art lover or student. Hibbs quite appropriately draws into the conversations several European Catholic thinkers (such as Jacques Maritain, Etienne Gilson, Leon Bloy and Jean-Luc Marion.) He cites Augustine, Simon Weil and T.S. Eliot. His essay is learned and a true joy to read. (I am not well schooled in art history and only an amateur in social and cultural theory; I relished the chance to read this finely argued and mature study, learning much, without wading through a 500 page treatise.) Thomas Hibbs, who teaches at Baylor University, may be known to some of our readers as he has appeared on the popular Mars Hill Audio interviews with Ken Myers. We stock his book called Shows About Nothing which is a trenchant analysis of pop culture and nihilism. Hibbs is a serious man, it seems, and well suited to offer a dignified study of these two serious painters. This lovely and thoughtful chapter is somewhat like his other essays called “Refractions” found in his wonderful collection Refractions: A Journey of Faith, Art and Culture (NavPress; $24.95.) Fujimura is an excellent writer, a great teacher, a moving memoirist. We loved the book Refractions for his wonderful essays about culture, life, his work as an artist and how all of us might engage the world more thoughtfully and faithfully. I wrote a lot about it last March, for instance, here. In Soliloquies, it is wonderful to have the painter offering an eloquant glimpse of his inner life and how he sees the world, inspired so by this painter who (unlike other impressionists) was drawn to use the color black. One should not be surprised, in following Rouault, to find a philosopher like Yanagi, who does not identify himself as a Christian, write so eloquently of biblical realities. 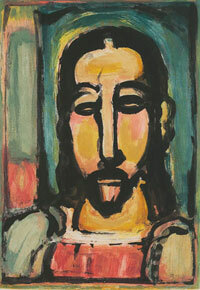 That, in essence, is the power of Rouault’s universe. He is not merely a “religious” painter: he was the painter of a greater generative Reality, of multiple colors behind our dark, foreboding and destructive world. Soliloquies are not, Hibbs points out, the same as monologues. There is dialogue here, interaction. Certainly Fujimura is doing a homage. But, also, we see Rouault afresh in this setting. Both Hibbs and Fujimura explain how this is so. The reader of Rouault Fujimura Soliloquies has the privilege of being a conversation partner with text and art, reading and looking, studying and pondering, learning and enjoying. These discussions are on-going. We are very pleased to offer this Square Halo book in celebration of historic art from a previous generation, and historic art made this year. Congratulations to Mako, his IAM organization, the Dillon Gallery, and Square Halo Books. We are thrilled to be making this book available to the wider public. Spread the word. This has been–truly–historic. What a joy to be able to announce it here. Byron, I was reading about Renaissance Humanism this morning in a book on Jesuit Humanism and you are truly a man of letters and arts, the “umanistica” who is passionate about all areas of knowledge. i passed on your review to an artist friend in europe.